Now is the time to treat yourself to our manicure set, and it also a special gift wrapped present. The most beautiful gift for Mother's Day. We guarantee and are responsible for the quality of your manicure tools. We personally checked box by box. We wrapped each set with care to be presented as a personalized gift and it is placed in a PVC bag that will keep your manicure case safe for use during traveling. With this set you can fix your nails to look like a professional did them. This is your own private professional manicure kit. Anything used in a salon you have here in the package. This is the perfect gift for a men or women. It has everything that you could need at home and when away from home. Here you have all kinds of clippers for both finger and toes nails. It comes with a sharpened clipper with a pointed tooth for nail edges if necessary. A scissor is also included. Because of the strong clippers, cutting your nails will be easier and faster. No more worries of not doing a good job with your weak hand. Cutting you toenails will be much easier. Everything you need organized in one case. 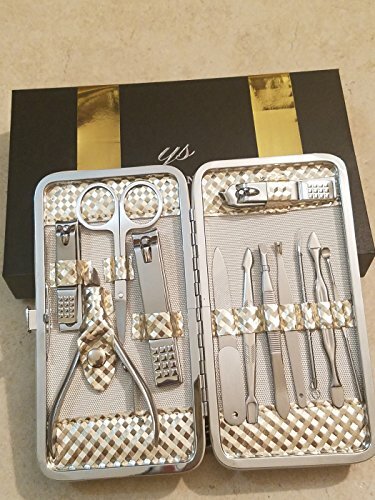 • Our Manicure set it is a special packaged gift wrapped present.This is your own private professional manicure kit. Anything used in a salon you have here in the package. This is the perfect gift for a men or women. It has everything that you could need at home and when away from home. Here you have all kinds of clippers for both finger and toes nails. It comes with a sharpened clipper with a pointed tooth for nail edges if necessary. A scissor is also included. The most beautiful gift for Mother's Day. All the tools are stainless steel and are of very high quality and we are completely responsible to you for the quality of our product. You can finish trimming your nails to be straight and smooth in minutes. For complicated nails you will find the right tools to solve your problem within the package. The kit contains: Small clipper for fingernails, Big clipper for toes nails and a pointed clipper for the edges. • A Special cutter for the edges of split body skin plus a Nail Scissor. • A Nail file with five nail care tools and tweezer. • An attractive gold metallic case in a gift box that makes it a wonderful gift for any occasion. If you have any questions about this product by Y.S. organize, contact us by completing and submitting the form below. If you are looking for a specif part number, please include it with your message.